Hello everyone! Where I live, the unofficial last weekend of the summer was quite a dreary one, but hopefully we still have a good number of warm and sunny days to look forward to. If so, here is a great summer salad that’s super easy and very refreshing. The first time I made this, it was part of a picnic dinner we had in a local park and it really hit the spot. I think we had it with some grilled steak, but it could really go with anything. 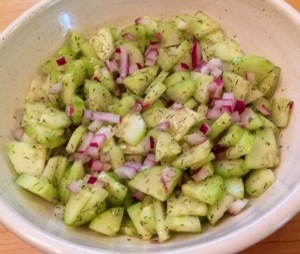 Peel the cucumber if desired, then cut into quarters lengthwise. Chop quarters into 1/8″ thick slices. You should end up with about 3 cups or so. Add to a medium sized bowl. Add the onion, dill, olive oil, and vinegar and mix well. This salad tastes best if it can sit for a few hours in the fridge to let the flavors meld a bit. Add salt and pepper to taste just before serving. Don’t add the salt before the salad sits or it will draw some water out of the cukes and leave you with a puddle in the bottom of the bowl. That’s it – simple, refreshing, and great summer side dish. If you’re lucky enough to have a good farmer’s market nearby, give it a look, get some super-fresh cukes, and give this salad a try! Hope you enjoy it! This entry was posted in Salad, Side dishes, Vegetables and tagged Balsamic vinegar, Cucumber, Dill, red onion, Salad, Vegetables. Bookmark the permalink.